The parking garage of One Kensington Gate, a Co-op apartment in Great Neck, NY, was flooded twice in three years resulting in damage to 40 vehicles and lost parking income to the building. The Co-op is situated at a low point on the street and is subject to street flooding that overtops the garage entrance and flows into the underground parking structure. Located in a non-flood zone, the building has an original drainage system installed by the city and a sump pump added by the property management company to protect against flash floods. However, the building does experience power outages during storms, which knocks out the power needed to run the sump pump. A retired engineer who lived in the building discovered the FloodBreak® Automatic Floodgate. After seeing a demonstration of the barrier being lifted by hydrostatic pressure, the Co-op decided to install the FloodBreak vehicle gate at the top of the garage entrance. It was easily retrofitted into the existing driveway and the wiper walls were affixed to the building sidewalls. To minimize the visual impact, the barrier was painted to match the driveway. The entire process from order to completed installation was accomplished in less than eight weeks. Within two months of installation, Kensington Gate experienced a flood event. 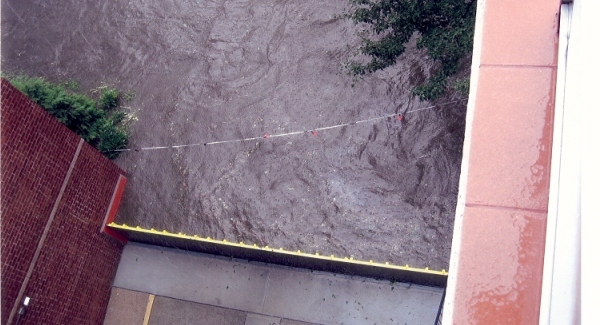 The FloodBreak barrier automatically deployed and kept the garage dry. The building has had eight saves in three years.